During the bad weather, Calderdale Council teams are continuing to work tirelessly to keep communities safe. When gale force winds and heavy rain hit the borough on Wednesday 12 February, the forestry team worked flat out around the clock to help residents. The team on standby responded to over a dozen call outs across Calderdale, working until 2am to clear trees and debris in tough conditions. Issues ranged from broken trees and debris on footpaths to 60ft trees falling down and blocking roads. Local people thanked teams for their speedy response and for making them feel safe. In one case, a huge tree collapsed into the road and a resident’s garden. Teams went out straight away, made the area safe, cleared the debris away and worked with the Council’s Highways team to get the road open quickly. In cases like this, the forestry team does a full safety assessment before leaving, and returns the day after to carry out further checks. Forestry team leader, Richard Robertshaw, said he couldn’t thank the team enough for their great work. With more bad weather forecast, the Council is busy getting prepared and advising residents to do the same. When it’s snowy or icy, the Council receives hundreds of calls from residents asking if / when their road will be gritted. Snow is unpredictable and we’re not able to give out information about individual roads, but Council services will be there when they can. Residents can also check the areas we grit and find out about any closures by visiting Winter services. Highways staff are on call 24 hours a day. They monitor the weather closely to ensure our roads are treated with salt before temperatures drop and icy patches form. There are over 600 grit bins in Calderdale to ensure main routes are gritted. If a grit bin needs to be refilled, you can request this online by visiting www.calderdale.gov.uk/transport/roads/winter-service, by emailing highwaysandengineering@calderdale.gov.uk or by calling 0845 245 7000. 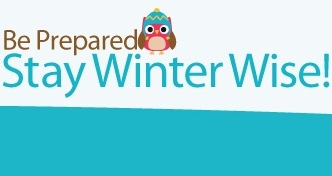 Be prepared for bad weather – visit www.calderdale.gov.uk/winter for information and advice. This entry was posted in Environment, Roads and Highways, Transport. Bookmark the permalink.